BERKELEY, CA  The next generation of artificial bone may rely on a few secrets from the sea. Scientists from the U.S. Department of Energy’s Lawrence Berkeley National Laboratory (Berkeley Lab) have harnessed the way seawater freezes to develop a porous, scaffolding-like material that is four times stronger than material currently used in synthetic bone. 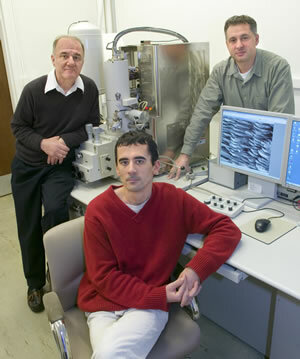 From left, Antoni Tomsia, Sylvain Deville, and Eduardo Saiz have developed a composite material that could lead to stronger artificial bone by mimicking nature. As reported in the January 27, 2006 edition of the journal Science, the Berkeley Lab scientists developed a composite that mirrors the intricate structure of nacre, which is a finely layered substance found in some mollusk shells, such as oysters and abalone. Scientists have long sought to duplicate nacre’s strength and lightness in ceramic materials, but nacre’s architecture varies at several length scales, from micrometers to nanometers. Replicating all of these scales — each of which contributes to the overall performance of nacre — in a synthetic substance is extremely difficult. Then, the Berkeley Lab researchers thought of sea ice. “We allow nature to guide the process. Seawater can freeze like a layered material, so why not use this property to cast ceramics that mimic nacre,” says Antoni Tomsia of Berkeley Lab's Materials Sciences Division, who developed the composite with fellow Materials Sciences Division researchers Sylvain Deville, Eduardo Saiz, and Ravi Nalla. Because of the pressing need for longer-lasting artificial bone, researchers like Tomsia have developed materials that take their cue from nature. In this case, Tomsia and colleagues turned to the ocean. When seawater freezes, crystals of pure ice form layers, while impurities such as salt and microorganisms are expelled from the forming ice and entrapped in channels between the ice crystals. The result is a layered structure that roughly resembles nacre’s wafer-like construction. The Berkeley Lab team believed this same freezing process could be used to cast an exquisitely layered material that comes close to mimicking nacre’s toughness and lightness. They created a watery suspension of hydroxyapatite, which is the mineral component of bone. Then, they froze it. Just like the impurities in sea ice, the hydroxyapatite concentrates in the space between the ice crystals, creating layers and layers of nacre-like material. They also found that by increasing the rate of this freezing process, the layered structure reduces in scale. Ultimately, they obtained a microstructure that measures one micron, or one-millionth of a meter. 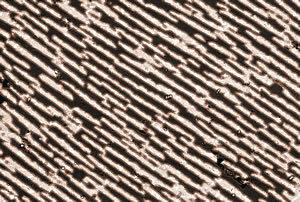 In comparison, nacre’s structure measures half of a micron. “We are half a micron away from mimicking nature,” says Tomsia. After the ice is removed via sublimation, the result is a porous scaffolding composed of hydroxyapatite that exhibits striking similarities to nacre’s multilayered structure across a wide range of length scales. Like nacre, the surface of each layer is rough, helping the layers lock in place with whatever substance fills the space between them. And some bridges form between the layers, which are believed to increase fracture resistance. In the future, the Berkeley Lab scientists hope to tailor the scaffolding so that it fosters bone tissue regeneration. To do this, the space between the scaffolding’s layers can be filled with an organic polymer that degrades over the span of several weeks, liberating antibiotics and compounds that stimulate bone growth. 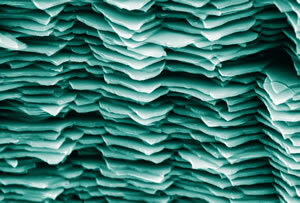 Ultimately, their technique may enable the fabrication of new materials with properties that cannot be achieved by nature or conventional processing techniques. It combines nature’s sophisticated architectures, which are designed over a wide range of length scales, with scientists’ ability to choose from an unlimited number of material combinations. The research presented in the Science article, “Freezing as a Path to Build Complex Composites,” was supported by funding from the Department of Energy’s Basic Energy Sciences program and the National Institutes of Health.